I've been away a few days to help my parents with a massive garage sale, the second in a series to help downsize my mom's flea market collection. 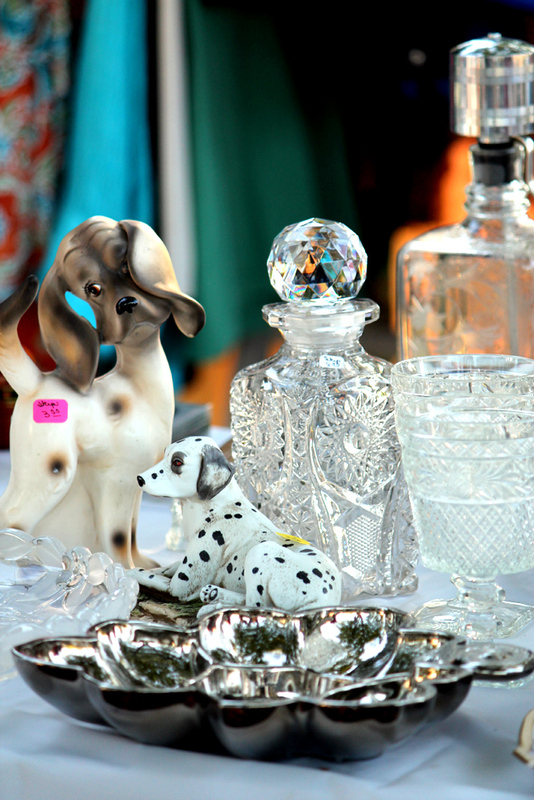 On day three we got to the point of selling lovely vintage glassware for a buck. Have you been to or had a good garage sale lately? Pretty photos! The dog figurines reminds me of a ceramic "weather poodle" that came from my grandmother's house. It's supposed to change color (no joke) when the weather changes. I stopped yard saleing and started Goodwilling....not as hot. And I hate to give a yard sale. Nice glassware. Yeah, throwing a garage sale is killer. But we had the whole family hanging out. It became a bit of a party. Do you have a new camera? If so, what is it???!!! Have you thought of selling these on Etsy? I love vintage glassware. You are so sharp-eyed my dear. I borrowed my dad's Canon T3 with my zoom lens. It does a lot better in low light than my old 20D. I have Canon EOS Rebel T3 but it's not as good as your Dads. I think it's because I'm using it with the lens it cam with. Do you mind me asking what lens you used for these pics? 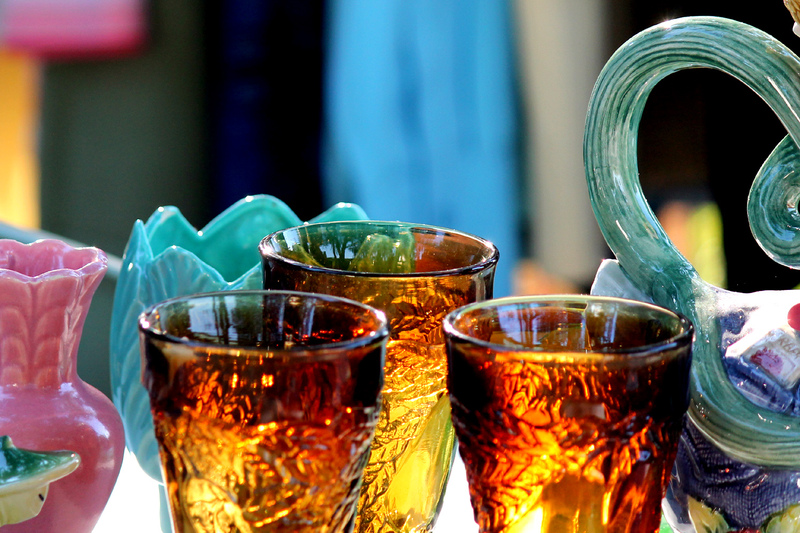 Oh, and btw, when I asked you about selling on Etsy I meant vintage glassware. I've seen some Etsy shops that do that. Maya, it's a Canon EF 75-300mm f/4-5.6. I got it for $100 during some sale on Amazon. Usually it's $200 or a little less. It does pretty good. Not great for low low light situations but you can get a nice fuzzy background (short depth of field) with it. If I lived near my mom we'd definately do an Etsy shop. At the moment, we are just trying to do a mass movement out the door. She has a whole barn full of glassware. Wow! I wish I lived close to your Mom too! LOL I would have loved to take a pick inside her barn full of vintage! Have a great week, dear. Dear Bromeliad, is this garage sale anywhere near New York? I have a cousin who's interested in vintage pieces who lives in Jersey City. I wish. It's in Ohio.